Available in a rainbow of vibrant colors, but best known as a ruby doppelgänger, the spinel has joined the yellow-green peridot as an official birthstone for the month of August. The American Gem Trade Association (AGTA) and Jewelers of America (JA) delivered the surprising news in June. It was only third time in the past 104 years that the modern birthstone list had been updated. "At certain moments in history, when there is a strong call from gem enthusiasts to expand the list of official birthstones, Jewelers of America believes in recognizing the importance of historically significant gemstones and giving gemstone lovers a choice that suits their preferences,” said JA President and CEO David Bonaparte. The International Colored Gemstone Association (ICA) called spinel "the great impostor of gemstone history." That's because some of the most famous "rubies" in crown jewels around the world are actually spinels. Prominently displayed on the Imperial State Crown of England is the 170-carat Black Prince Ruby, which is actually a uncut spinel. 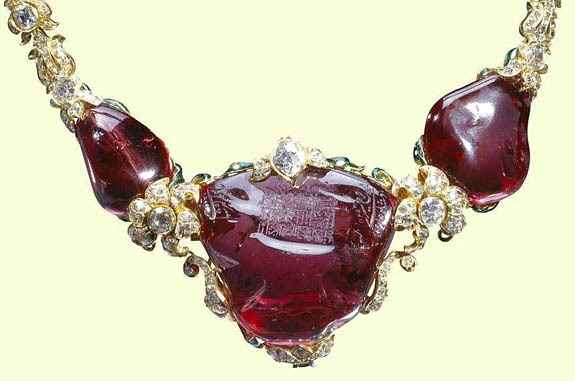 The 361-carat Timur Ruby, which was presented by the East India Company to Queen Victoria as a gift in 1851, and is engraved with the names of some of the Mughal emperors who previously owned it, was later identified as a spinel. And the 398-carat ruby-red gem that tops the Imperial Crown of Russia commissioned by Catherine the Great in 1763 turned out to be, you guessed it, a spinel. The masquerade continued until gemologists and mineralogists finally developed the technical ability to distinguish spinel from ruby. Chemically, the two gems are similar. Both spinel and ruby are aluminum oxides, but spinel contains magnesium and ruby doesn't. Both spinel and ruby get their red coloring from minute amounts of chromium, which replace some of the aluminum within the crystal. 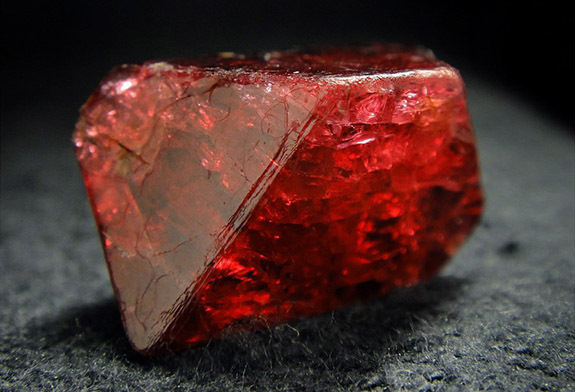 The chromium so vital to the ruby’s blazing color is also responsible for causing fissures in the crystal, making rubies larger than 3 carats in size extremely rare and very valuable. Spinel comes in a variety of vibrant colors, including soft pastel shades of pink and purple, fiery oranges, and cool hues ranging from powdery gray to intense blue. 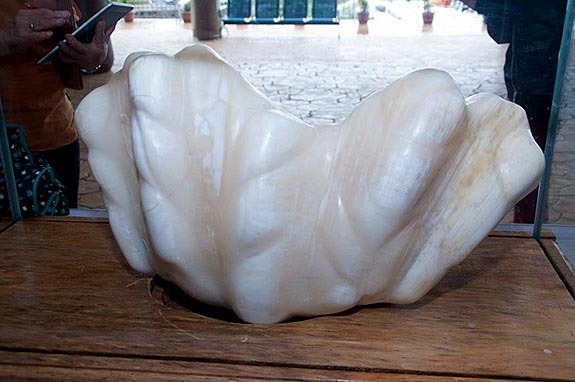 It is a durable gem with a a hardness of 8.0 on the Mohs Hardness Scale. By comparison, diamond rates a 10 and ruby rates a 9. Some of the most beautiful spinels — especially the pink, red and orange-red varieties — are found in Myanmar. They're also sourced from Afghanistan, Brazil, Cambodia, Kenya, Russia, Sri Lanka, Tanzania, Thailand and Vietnam. 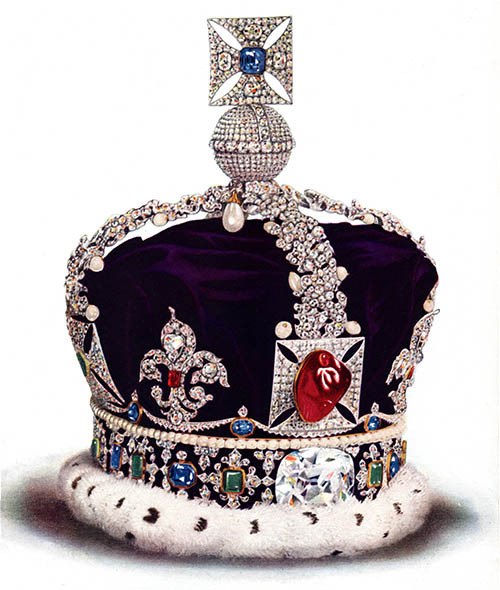 Credits: Spinel crystal by Smallru (Own work) [CC BY-SA 4.0], via Wikimedia Commons; Imperial State Crown of England by Cyril Davenport (1848 – 1941) [Public domain], via Wikimedia Commons. 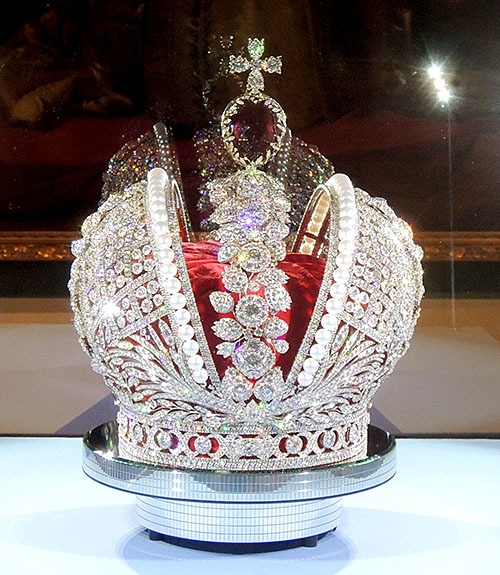 Timur Ruby via the Royal Collection Trust © Her Majesty Queen Elizabeth II 2012; Smolensk Diamonds' modern interpretation of the Imperial Crown of Russia by Shakko (Own work) [CC BY-SA 3.0], via Wikimedia Commons. 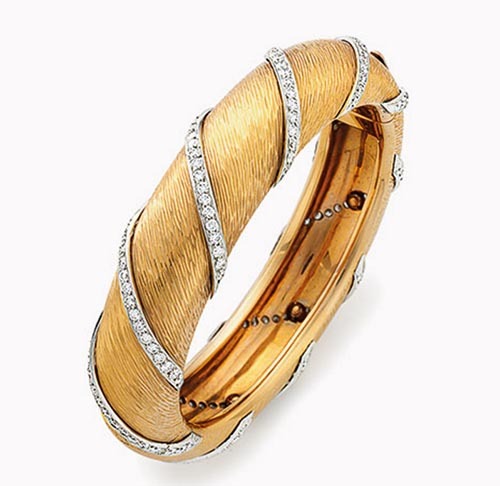 • Do not pack valuable jewelry in boxes and do not put your jewelry into storage. It can get lost with other items or stolen. • If you’re moving locally, keep valuable items in a safety deposit box at a bank until you’re settled in and ready to retrieve them. 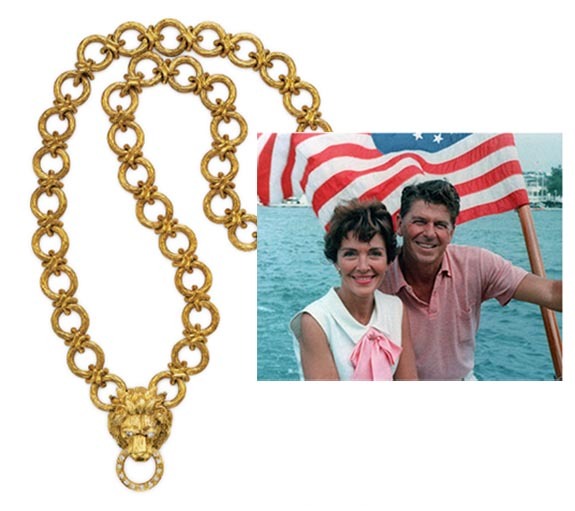 If you’re moving a long distance, keep valuable jewelry with you at all times. • Don’t wear jewelry while you’re packing, unpacking or doing heavy lifting. You may damage, bend or scratch precious metals, or chip valuable stones. • Pack earrings, necklaces and bracelets separately so they don’t get tangled. Use zip-type small storage bags or pill organizers. • Keep track of your items. Take a picture of each piece and create a detailed list of the items. Be sure to write a description for each piece and include serial numbers for items that have them. Make two copies of the list – take one with you when you move, and store the other one in a safety deposit box. 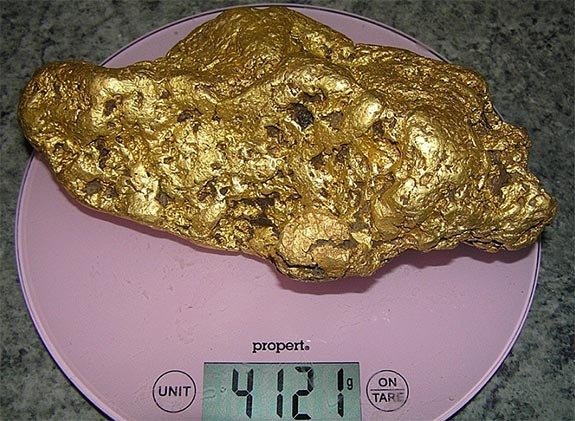 • Make sure your valuable items have been recently appraised to reflect their current values and replacement costs. If necessary, adjust your coverage accordingly. Make copies of appraisals and receipts. Again, take one copy with you and place the other in a safety deposit box. • Your jewelry should be properly insured. If your jewelry is covered under your homeowners’ or rental policy, it may only be insured for up to $1,000. Also, be sure your insurance company covers "mysterious disappearance." Often, it won't. • Resist using social media. As tempting as it is to share the excitement of your move, save the stories and photos for your housewarming party. Well intentioned posts can easily extend past your group of friends. Your family's jewels are more vulnerable during your move, so the fewer people who know about it, the better. For more information on protecting your jewelry, visit Jewelers Mutual Insurance Company's website here. 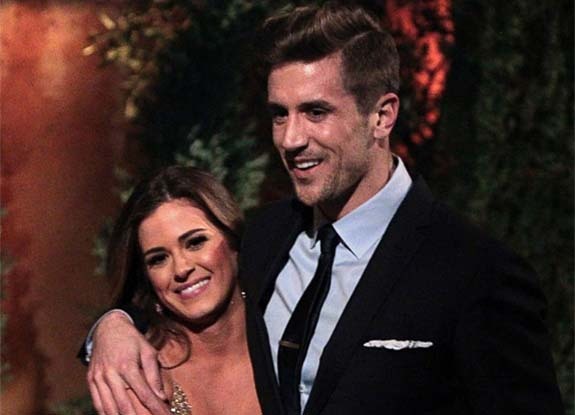 More than 8.4 million fans of The Bachelorette watched breathlessly as JoJo Fletcher professed her love to Jordan Rodgers during Monday's climactic two-hour season finale. The former NFL player responded by getting down on one knee and presenting the real estate developer with a 3.5-carat diamond engagement ring valued at $85,000. 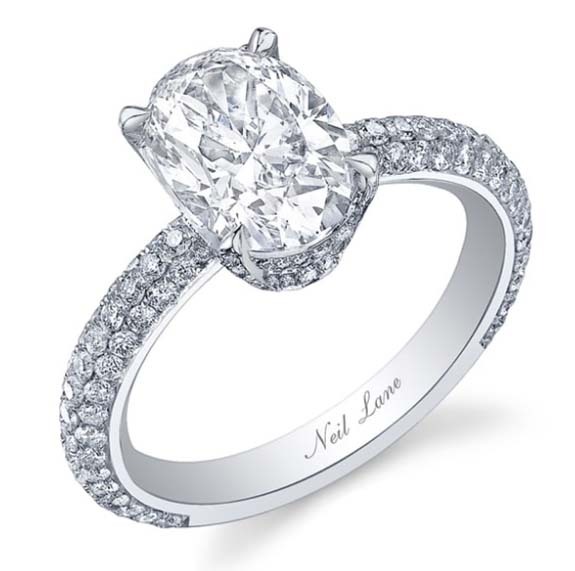 The ring features an oval-cut center stone accented with pavé diamonds on a platinum band. 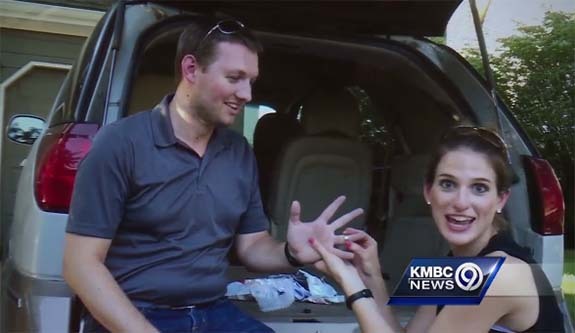 In the romantic lead up to the proposal, the 27-year-old aspiring sports broadcaster said, “It’s moments like this, where I’m holding your hand, I’m looking in your eyes, and I know I’m so unbelievably in love with you. You’re my best friend, you’re my soulmate." An insider told Us Weekly that the oval-cut diamond ring by Neil Lane was Rodgers' favorite from the moment he saw it. 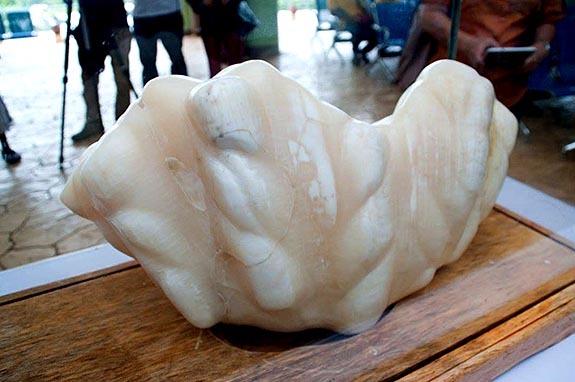 "She also loves it," said the insider, "and it's one of the most unusual and rare cut stones to be seen on the show thus far." Earlier in the episode Fletcher, 25, was forced to send runner-up Robby Hayes packing. Fletcher and Rodgers will get to keep the $85,000 ring if their relationship remains intact. The Bachelor host Chris Harrison was unclear about the rules regarding when a ring must be returned to designer Lane. "There's some rule, after a certain number of years, you get to keep it anyway," he told Us Weekly. "But after months [if there is a breakup]... it goes back." Us Weekly noted that out of 20 seasons of The Bachelor and 11 seasons of The Bachelorette, only a handful of couples have remained together, including married pairs Trista and Ryan Sutter, Desiree Hartsock and Chris Siegfried, Sean Lowe and Catherine Giudici, and Ashley Hebert and J.P. Rosenbaum. 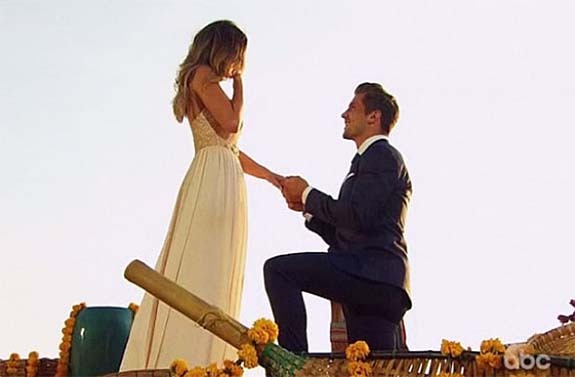 Season 11 Bachelorette Kaitlyn Bristowe and her final pick, Shawn Booth, are still happily engaged. Credit: Bachelorette images and screen captures via ABC. Ring image courtesy of Neil Lane. 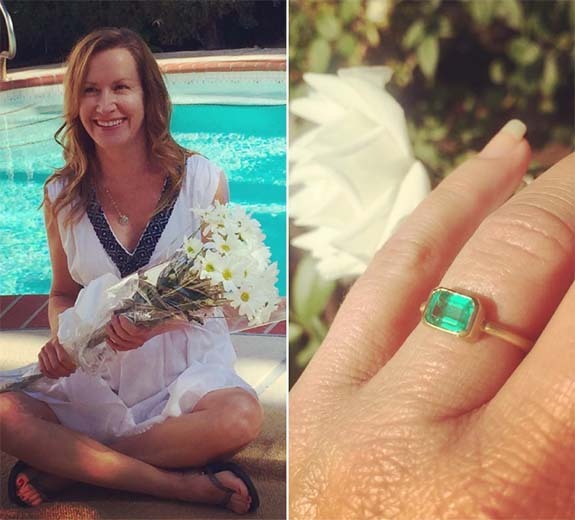 The Office star Angela Kinsey and her long-time beau, Joshua Snyder, are engaged. 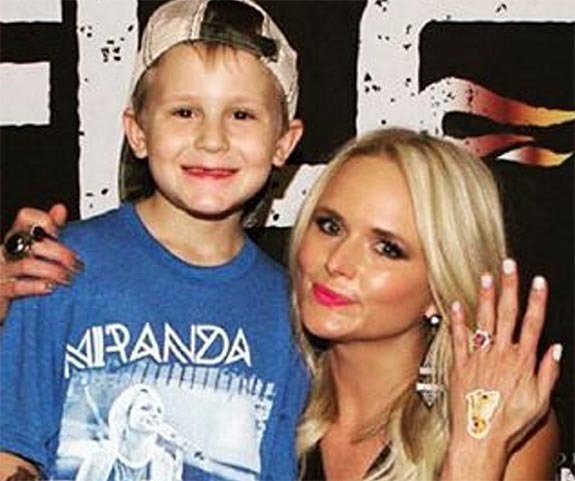 Kinsey took to Instagram last Thursday to announce the good news and to show off a non-traditional colored gemstone engagement ring that honors her new blended family. The actress revealed that the couple’s three children from previous relationships witnessed Snyder popping the question with a unique ring featuring a vibrant emerald center stone set horizontally into a simple yellow-gold band. Emerald engagement rings are an option for those who want to “go green” to express their individual style. Kinsey joins former First Lady Jackie Kennedy on the short list of luminaries who have worn emerald engagement rings. • Kennedy’s famous engagement ring featured a 2.88-carat diamond mounted alongside a 2.84-carat emerald. 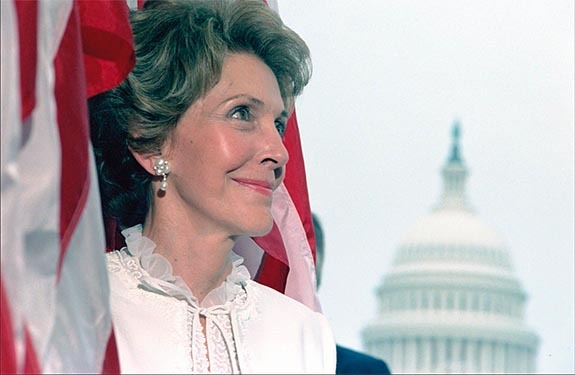 During John F. Kennedy’s presidency, the ring was redesigned with more than 2 carats of round and marquise accent diamonds. • In 2012, French film actor Olivier Martinez famously asked actress Halle Berry for her hand with a diamond and emerald engagement ring designed by Robert Mazlo. The couple split in 2015. • In 2013, comedian and screenwriter Jason Sudeikis presented Olivia Wilde with a classic round diamond surrounded by a gorgeous emerald halo (to match her eyes). The couple is expecting their second child. • Earlier this year, former tennis pro Ruben Torres proposed to actress Hilary Swank with a natural Colombian emerald on a platinum Art Deco-inspired setting. 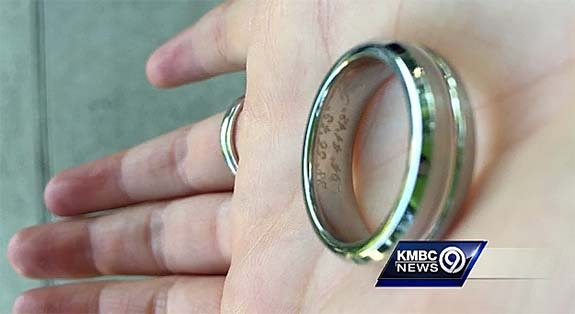 The ring was beautiful, but the couple split a few months later. Kinsey is best known for her role as the uptight, religious cat-loving accountant Angela Martin in the NBC mega hit, The Office. Joshua Snyder is an actor and writer best known for his roles in Shopgirl (2005), The Glass Beads (2005) and Short Track (2008). Kinsey was previously married to Warren Lieberstein, with whom she shares an eight-year-old daughter, Isabelle. The couple divorced in 2010. Back in early April, jewelry designer JS Diamonds posted this incredible 80-carat emerald-cut diamond engagement ring on its Instagram page, along with the caption, "Not your every day ring!! 80 carat emerald cut #diamond #bigrock." Over the next four months, the post accumulated 567 likes and 90 comments. 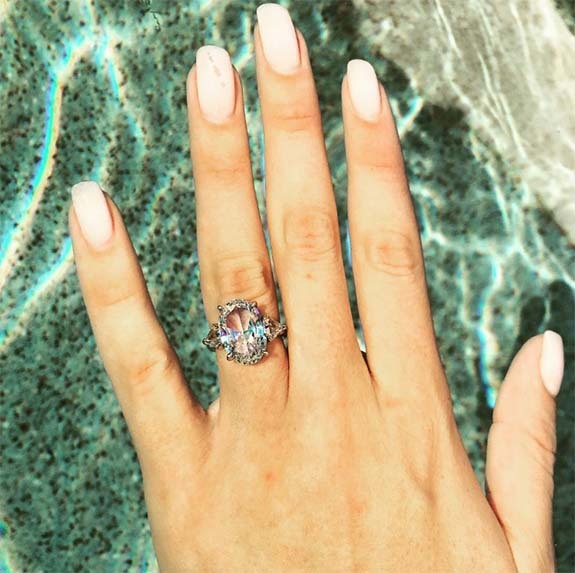 But, then on August 6, the fine jewelry blog Gem Hunt reposted the ring on its Instagram page, and the results were astonishing. Not only did the post earn 2,700 likes and 327 comments in just four days, but it also caught the attention of style writers from Cosmopolitan, Marie Claire, WhoWhatWear and Brit + Co., among others. 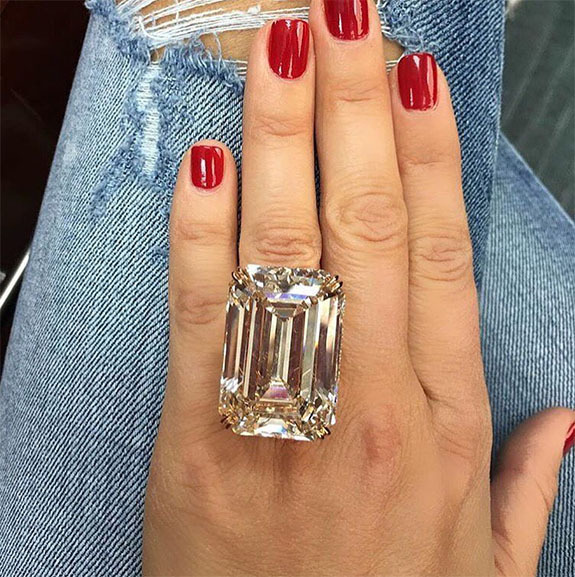 The writers seemed to enjoy the fact that the 80-carat diamond was far larger than even the blingiest engagement rings worn by such A-listers as Kim Kardashian-West (15 carats), Ciara (12-15 carats) and Mariah Carey (35 carats). One scribe did some quick math to extrapolate the approximate value of the 80-carat stunner. 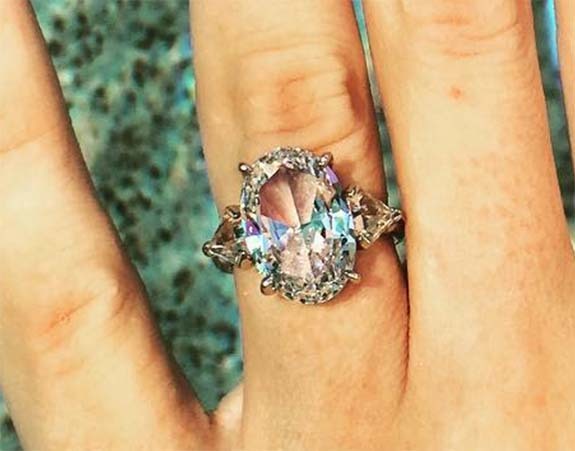 If Carey's ring was worth $7.4 million, she reasoned, the much larger ring would probably sell for more than $15 million. In Cosmopolitan UK, readers were asked about their preference of engagement rings: "big and bling" or "understated and simple." Then the writer injected her own opinion: "Well, after seeing [this] ring, your dream scenario may just hit new, extravagant heights of sparkling, shiny beauty." The writer concluded that although this style might not be for everyone, and that less-is-more is just as beautiful and elegant, "there's no denying that this would turn a few heads. Do you fancy yourself sparkling in it?" At Marie Claire, the style writer asked her readers, "Would you wear it, if you could? Is this really the dream engagement ring?" 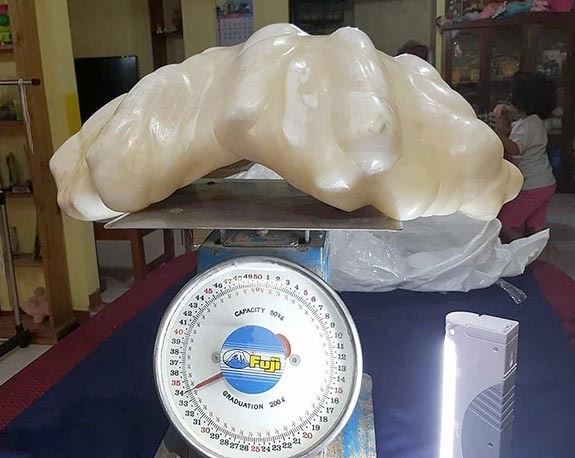 "Knowing that your carat count is higher than Mariah, Kim K and Ciara’s combined would be a pretty fun statement to throw around at parties," she wrote, "and there’s no doubt you’re going to turn heads with this, blinding all onlookers." 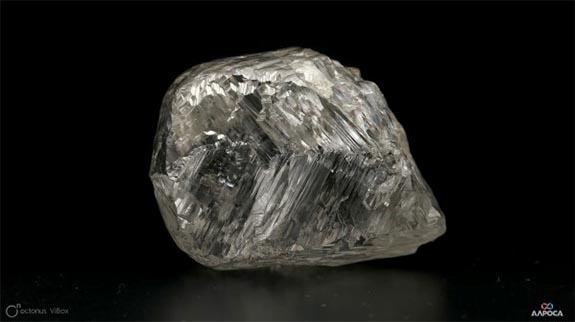 She conceded, however, that with a rock that big, some people would think the diamond was a "shard of cubic zirconia." A writer at WhoWhatWear.com admitted the 80-carat diamond engagement ring was unlike any jewelry she's ever seen. 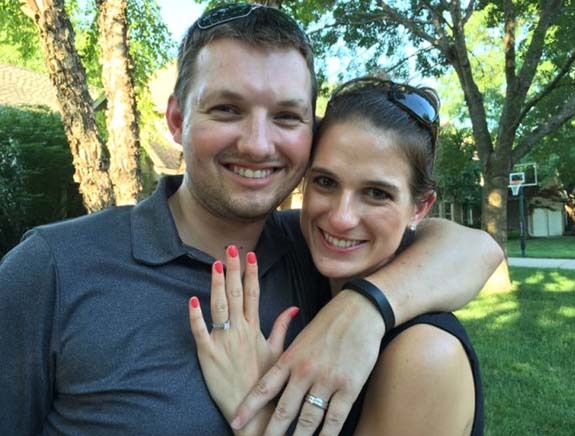 "We came across the hugest diamond engagement ring we've seen in a long time. 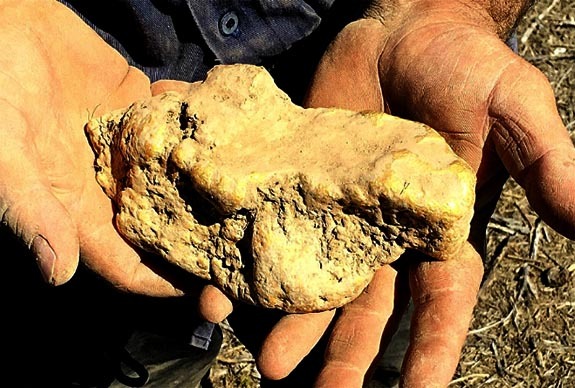 Scratch that—it's the hugest one ever," she wrote. "The emerald-cut stone is a whopping 80 carats! We can only imagine what it feels like to put a ring like that on your finger. It's nearly half the size of the model's hand and is probably pretty heavy. In any case, it's stunningly beautiful." And Brit + Co. summed it up perfectly, when a style writer concluded, "Just when you thought you couldn’t possibly be shocked by the size of a diamond after seeing examples like Ciara’s jaw-droppingly giant engagement ring and double-band diamond sparkler wedding ring, BAM, here’s an 80-carat engagement ring to totally blow your mind. That’s right, 80-whopping-carats of stunning diamond beauty that is truly beyond spectacular." Hey, it's Music Friday when we bring you fabulous songs with jewelry, gemstones or precious metals in the lyrics or title. Today, a cowboy learns a valuable life lesson in Kenny Rogers' 1991 hit, "If You Want to Find Love." 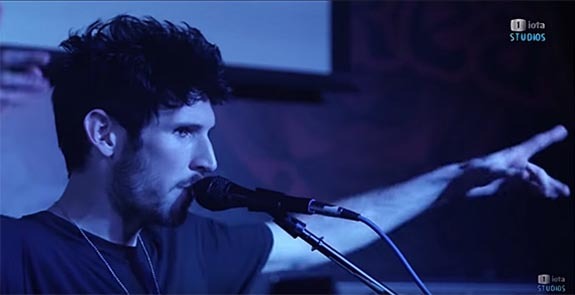 Co-written by Rogers, Skip Ewing and Max D. Barnes, the song uses multiple jewelry and precious metal references to tell the story of two strangers who meet in a bar. The man has a cheating heart, but the woman sets him straight. She reacts to the cowboy's advances with the following advice: "If you wanna find gold / Go looking in the mountains / If you wanna find silver / Go digging in stones / If you wanna find heaven / Go reading in the Bible / If you wanna find love / Go looking at home." Later in the song, the woman focuses on the cowboy's wedding band. Rogers sings, "She touched the gold ring on his finger / And held it to the jukebox light / And she said, 'Stranger, think what you're losing / If you leave here with me tonight." "If You Want to Find Love" was released as the first single from Back Home Again, the county music superstar's 24th studio album. The single reached #11 on the Billboard Hot Country Singles & Tracks chart. 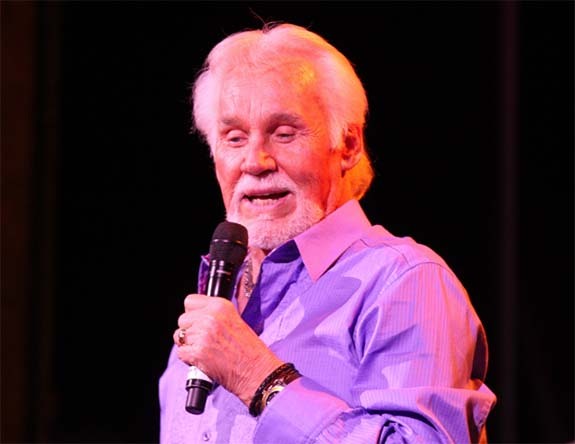 Born in Houston in 1938, Kenneth Ray "Kenny" Rogers is one of the most successful country artists of all time. He has charted more than 120 singles and topped the country and pop album charts for more than 200 individual weeks. In all, he has sold more than 120 million records worldwide and, amazingly, charted a record within each of the last seven decades. The soon-to-be 78-year-old (his birthday is August 21) announced in 2015 that he would be retiring from show business after a final tour, which he is calling "The Gambler’s Last Deal.” Shows will run through April of 2017. Written by Skip Ewing, Max D. Barnes and Kenny Rogers. Performed by Kenny Rogers. Dropping quarters all night long. He said, tell me: are you lonely? Is there some place we can go? If you leave here with me tonight. And if you need me I'll be at home. Credit: Kenny Rogers by Eva Rinaldi [CC BY-SA 2.0], via Wikimedia Commons. 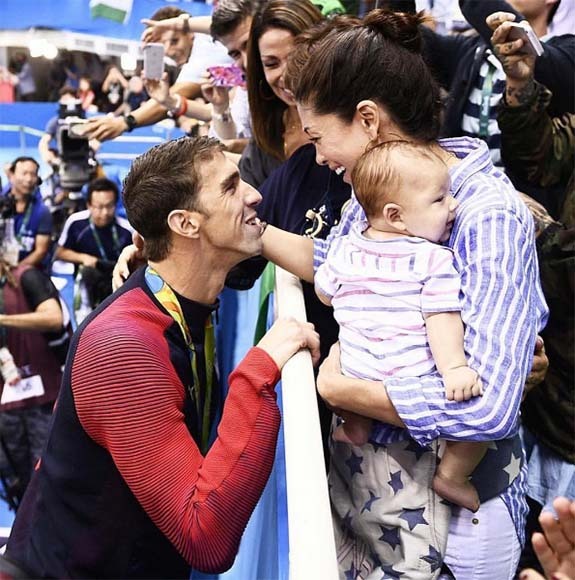 If you've been mesmerized by the swimming feats of Olympic legend Michael Phelps, you may be equally impressed by his taste in bridal jewelry. 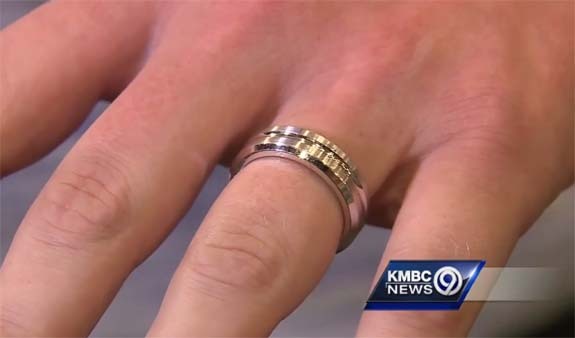 The engagement ring you see here was presented by Phelps to former Miss California Nicole Johnson when he proposed to her in February of 2015. Exactly a year later, Johnson posted a closeup of the ring and offered a peek into the symbolism of the large oval-cut diamond center stone and what seem to be shield-shaped side stones. She wrote: "[The] center is a pool representing our pool of love and each side stone is shaped like rain drops that continue to fill our pool. Thank you @intagemsanddiamonds for helping @m_phelps00 create the most beautiful ring I've ever seen. #imnotbiased #ringselfie #rings #engaged #soontobemrs"
Her February post was well received by her 303,000 followers as it generated 15,400 likes and 1,081 comments. 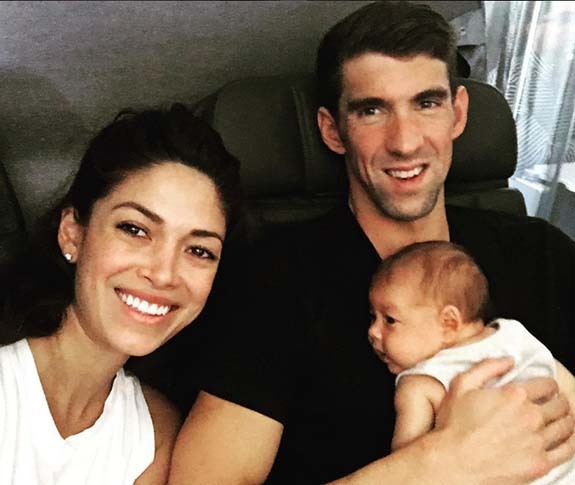 While Phelps became the biggest story of the Rio Olympic Games, NBC's television cameras repeatedly cut away to emotional shots of the swimmer's supportive fiancée and their new baby, Boomer Robert Phelps, who was born on May 5th. Phelps entered the Rio Games as the most decorated Olympian in history, with 22 medals, including 18 golds. As a 31-year-old, he added five golds and a silver during eight grueling days of competition — a competition that he says will be his last. He won his 23rd, and final, Olympic gold medal Saturday night by swimming his best stroke, the butterfly, in the 4x100 medley. Phelps and Johnson met at the ESPY Awards in 2007 and have dated since 2009. 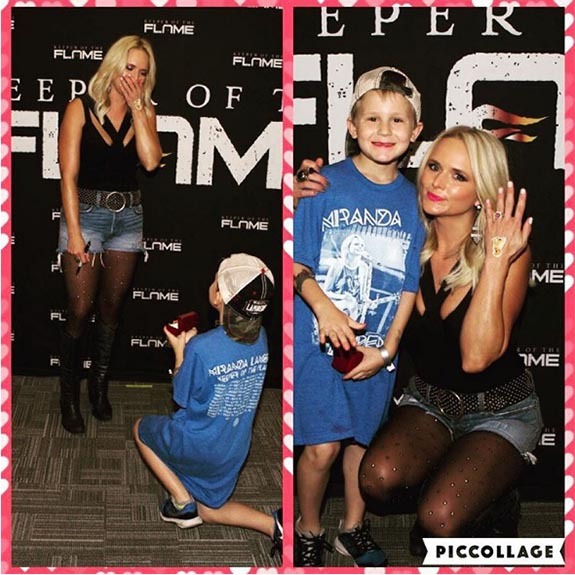 They announced their engagement in February of 2015 and their wedding is scheduled for the end of this year. After completing her near-flawless floor routine for which she earned a 15.433, U.S. gymnastics team captain Aly Raisman burst into tears when she realized she had edged out Russia's Aliya Mustafina for the Olympic silver medal in the women's all-around competition. As NBC's cameras zoomed in on the thrilling and emotional moment in Rio, we noticed that Raisman was wearing a very familiar pair of red, white and blue stud earrings — the lucky earrings she wore four years earlier at the London Games. The Newton, Mass., native said at the time that the earrings were her good luck charms and that she had rarely taken them off. Raisman wore them when she qualified for her all-around final, during pre-Olympic interviews and even during her Sports Illustrated cover shoot. 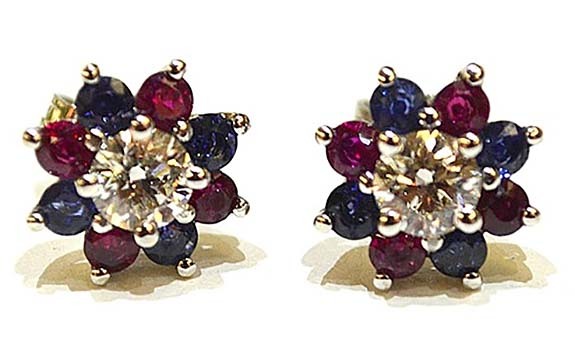 Designed by her hometown jeweler, Adamas Fine Jewelry, the simple earring feature round rubies and sapphires surrounding a larger round diamond. 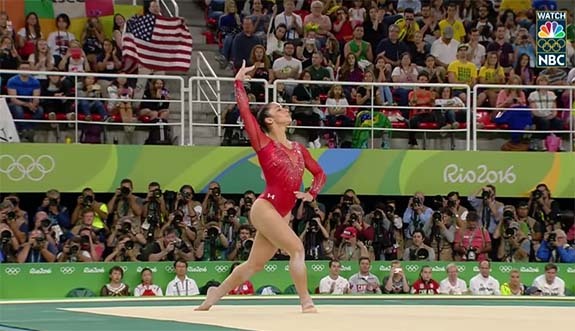 “I love the patriotism look,” Raisman told Boston’s Channel 7 News. 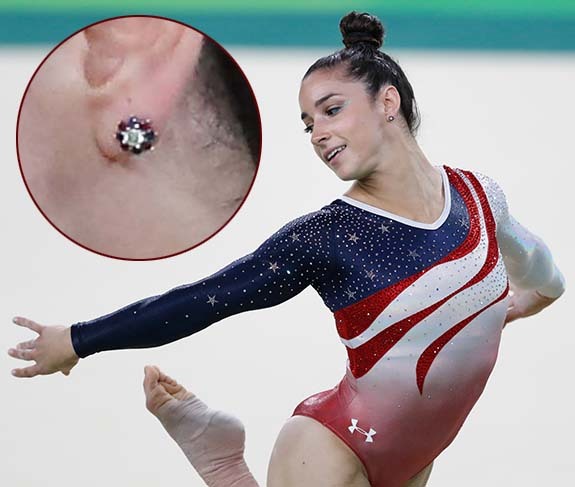 The jeweler had gifted the earrings to Raisman without knowing whether the world-class gymnast would be allowed to wear them during the Olympic competitions. Officially, the Olympic Committee has no formal rules about the subject. Instead, the governing body of each sport sets its own rules. Gymnasts may wear earrings as long as they are simple studs (one in each ear). With more than 31 million viewers glued to their TVs on Thursday night as the 22-year-old Raisman and 19-year-old dynamo Simone Biles scored a silver/gold exacta for the U.S. in the women's all-around competition, we're wondering how many people watching at home were secretly coveting their own pair of patriotic starburst earrings. Credits: Aly Raisman screen captures via YouTube.com. 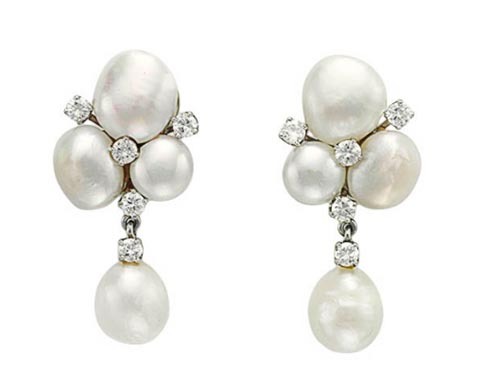 Earring studs photo by Adamas Fine Jewelry. Aly Raisman by Agência Brasil Fotografias [CC BY 2.0], via Wikimedia Commons. 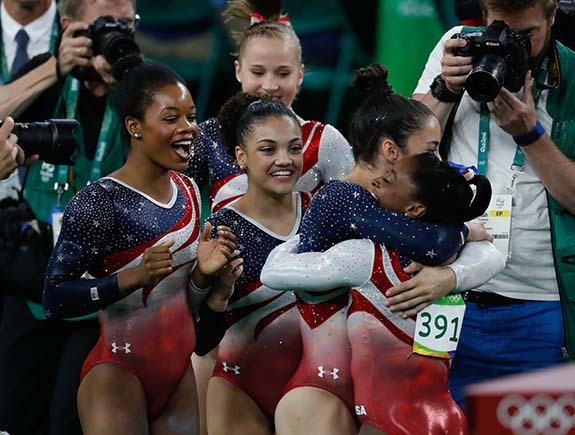 When the U.S. women's Olympic gymnastics team overpowered its competition to defend the gold medal in the team all-around competition at the 2016 Summer Games in Rio the athletes were certainly dressed for the success. Their patriotic leotards radiated with 4,000 white and red Swarovski crystals. 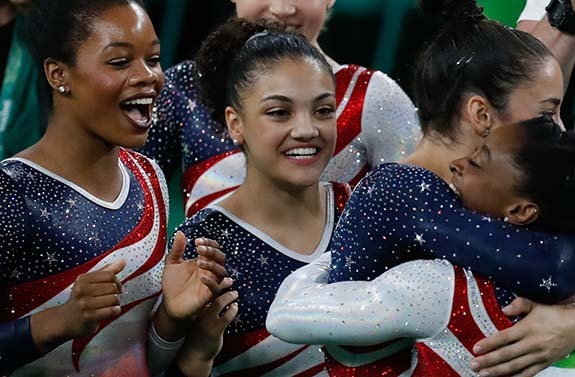 Teammates Simone Biles, Gabby Douglas, Aly Raisman, Laurie Hernandez and Madison Kocian beamed with confidence, thanks to GK Elite, the official outfitter of the U.S. national team. Kelly McKeown, executive vice president at GK Elite, told USA Today how her company designed the leotards to deliver the maximum impact for a world stage. GK worked with U.S. Olympics gymnastics coach Martha Koroly to make sure they were creating a "wow" moment for the athletes. "Marta has said it many times: 'It has to be like a prom dress.' She wants them to walk out and look regal, and unique and exquisite and dynamic. She’s not interested in having something very plain. She wants it to be their day out there." 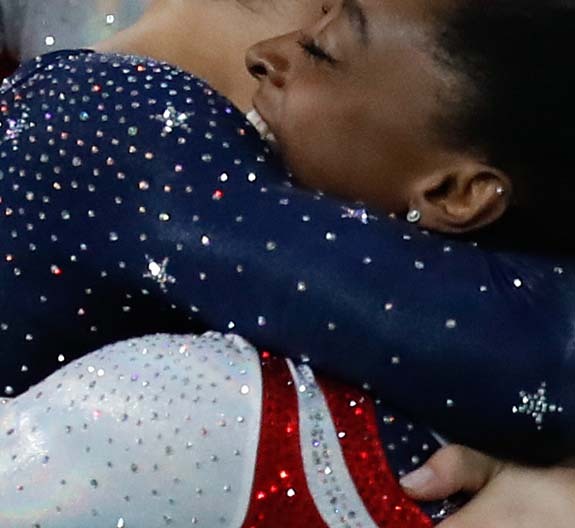 Each athlete was outfitted with 12 practice leotards at $60 to $200 each, and eight competition leotards priced from $700 to $1,200, depending on the number of crystals used in the design. A U.S. female gymnast's Olympic wardrobe can cost upward of $12,000. "They prepared their whole lives to be out there, in the biggest arena in the entire world," McKeown said. "You have to feel beautiful. It feeds into how you feel when you walk out there. It's a combination of morale boost and confidence and everything they are trying to achieve." The stunning leotards seemed to have a light source of their own. Joked McKeown, "People keep asking me, 'So where do you hide the battery packs? Because it looks like they are glowing.' I laugh because it’s all the fastening of the crystal." In Olympics past, the task of affixing crystals to a leotard was an expensive, manual task. The leotard worn by American Nastia Liukin in Beijing eight years ago, for example, featured 184 crystals that were mostly hand-placed. Crystal-application technology has come a long way since then, McKeown reported. GK Elite now has specialized bejeweling equipment that can robotically place a variety of crystal colors in a infinite range of designs. Credit: Image by Agência Brasil Fotografias [CC BY 2.0 (http://creativecommons.org/licenses/by/2.0)], via Wikimedia Commons. Fifteen hundred years ago in Datong City, China, there lived an aristocrat named Farong. 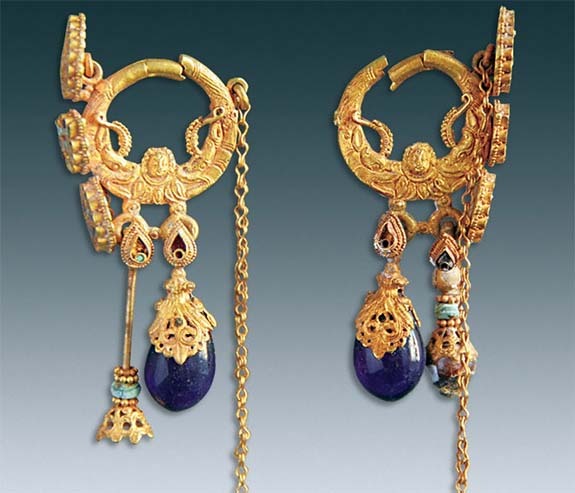 The wife of Magistrate Cui Zhen, Farong owned an elaborate pair of gold earrings that demonstrated meticulous craftsmanship and amazing technical prowess. The earrings were beautiful from every angle. From one view, one could see the likenesses of a human figure flanked by dragons. The detailing was extraordinary. 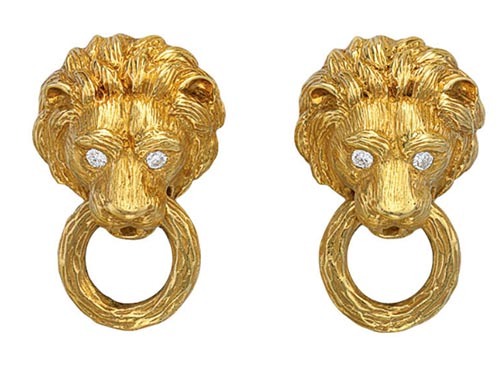 The human figure on the earrings had curly hair, deep-set eyes and a high nose. The character wore a pendant with a sequin-bead pattern on the neck and had inverted lotus flowers carved under its shoulders. 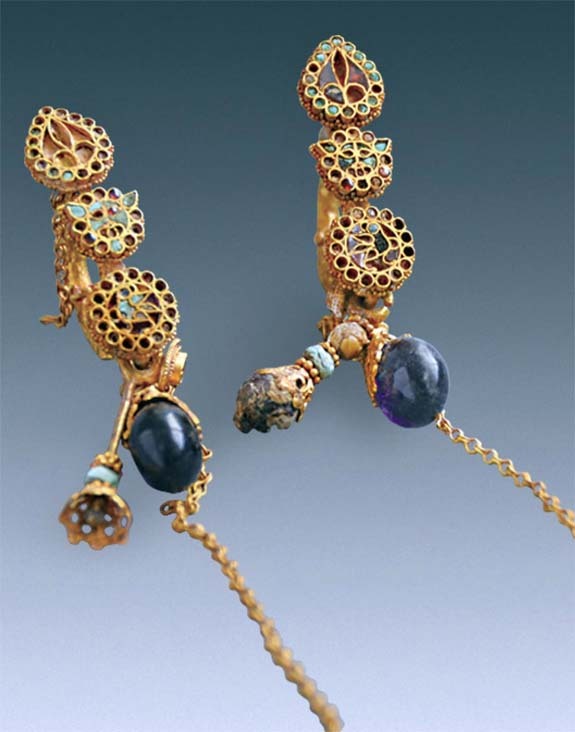 From the side, admirers would marvel at the round and teardrop-shaped adornments inlaid with multicolored gemstones. Delicate gold chains hanging from cabochon-cut amethysts dangled below, and one could imaging how they would have draped down the sides of Farong's face. Also among her prized possessions was an elaborate necklace made from 5,000 pearls, gold pieces, crystals and colored glass beads. 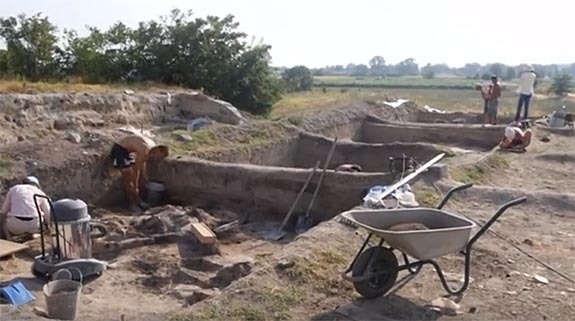 A team of Chinese archaeologists with the Datong Municipal Institute of Archaeology unearthed Farong's tomb when they were surveying the area before a construction project. 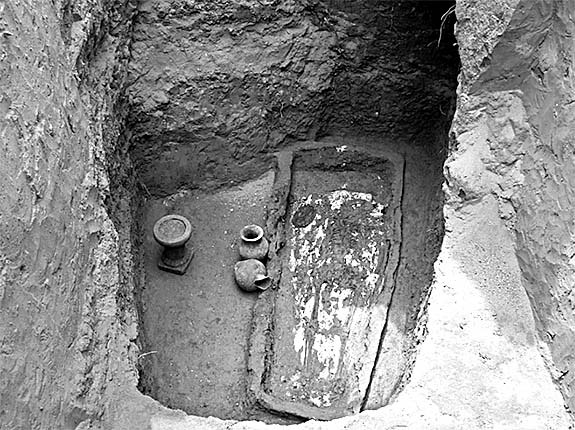 Although her skeleton was badly decomposed, her exquisite jewelry — which had been buried with her — remained in near-pristine condition. Farong's story was originally reported in the Chinese journal Wenwu and translated into English in the journal Chinese Cultural Relics. 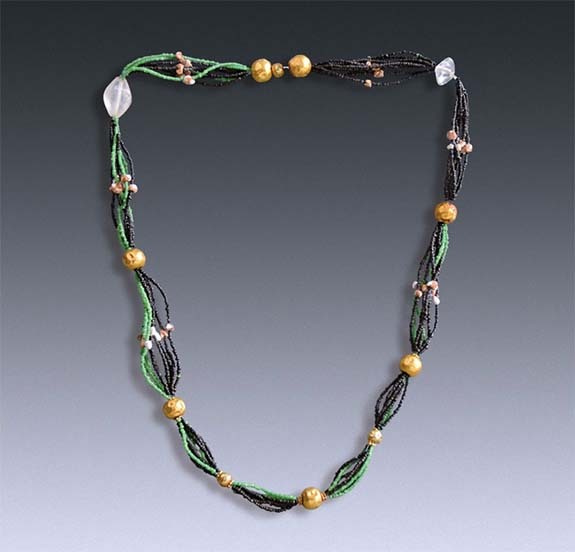 The necklace consisted of 10 large and small gold beads, nine flat gold pieces, two crystals, 42 natural pearls and more than 4,800 colorful glass beads. 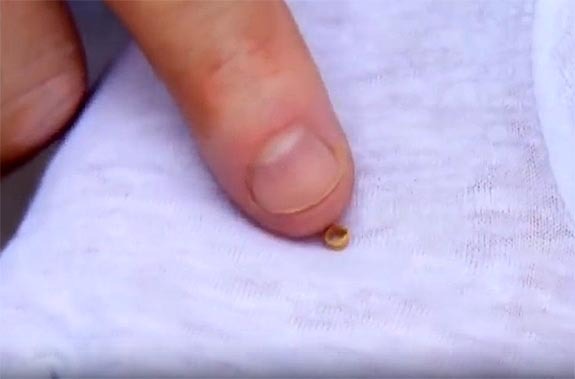 The archaeologists explained that the small beads were "the size of millet grains, some black and some green, and all are [flattened], each with a perforation in the middle." 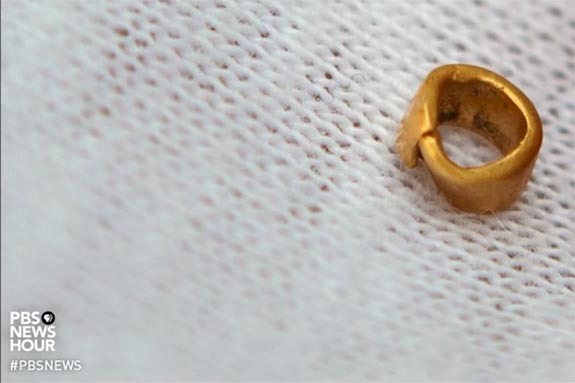 Although the thread on which the 5,000 beads were strung had disintegrated long ago, the beads remained in their original positions, making the reconstruction of the piece much easier for the archaeologists. Farong lived in the capital of Datong City, about 215 miles west of Beijing, during the latter part of the Northern Wei Dynasty (386-534). 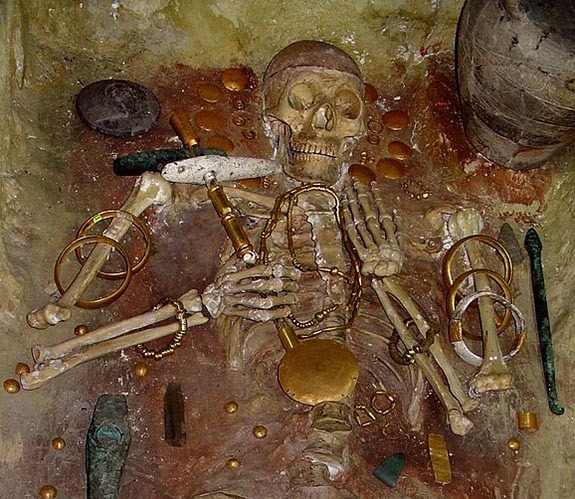 Her age at death was unknown, but the story of her fine jewelry may live on forever. Credits: Photos courtesy of Chinese Cultural Relics. Welcome to Music Friday when we bring you great throwback songs with jewelry, gemstones or precious metals in the title or lyrics. 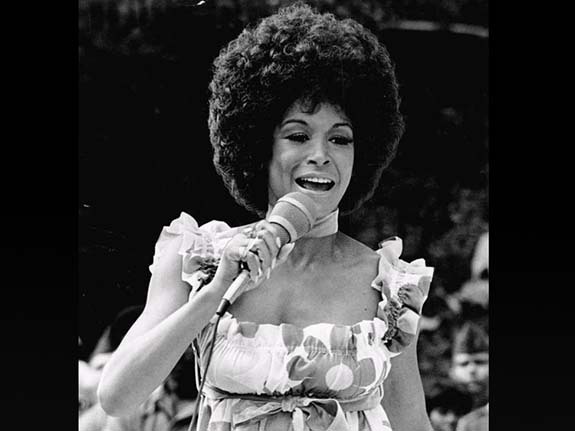 In today's installment, we time travel to Hollywood's Soul Train sound stage, where Freda Payne is singing her biggest hit, "Band of Gold." The song is about a young couple that rushes into marriage only to find out on their honeymoon that they are incompatible. He takes off, and she remains in a darkened room, dreaming of what could have been. Although the woman yearns for her estranged husband to return to her, deep in her heart she knows that all that remains of the relationship is the ring on her finger and the memories of their time together. She sings, "Now that you're gone / All that's left is a band of gold / All that's left of the dreams I hold / Is a band of gold / And the memories of what love could be / If you were still here with me." Released in April 1970, the song became a instant hit with worldwide sales of more than two million records. "Band of Gold" ascended to #3 on the U.S. Billboard Hot 100 chart and was #1 in the U.K. for six consecutive weeks. It was Payne's first gold record and remains her signature song 46 years later. Interestingly, Payne originally refused to record the song when it was offered to her by co-writer Ron Dunbar. She didn't like the lyrics and didn't like the idea of a relationship falling apart during a honeymoon. 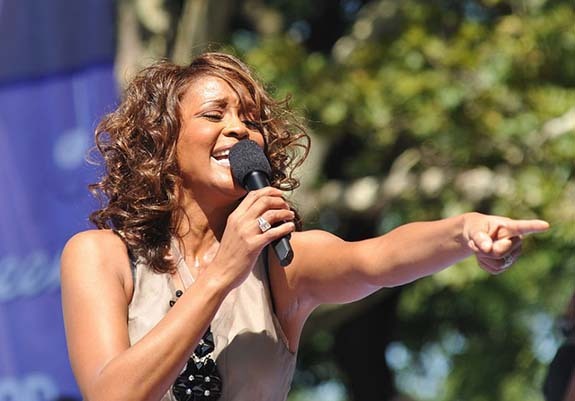 Dunbar encouraged Payne to perform the song, despite her reluctance. He said, "Don't worry. 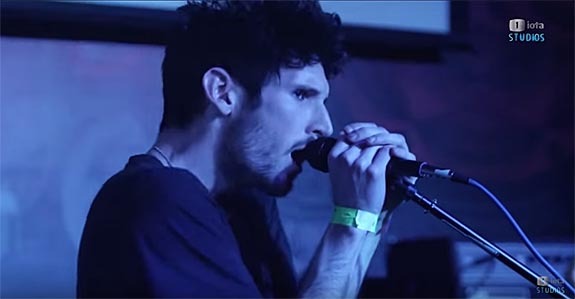 You don't have to like [the lyrics]. Just learn [them]." Payne agreed, and the rest is history. In 2004, "Band of Gold" was voted #391 in Rolling Stone magazine's listing of the 500 Greatest Songs of All Time. 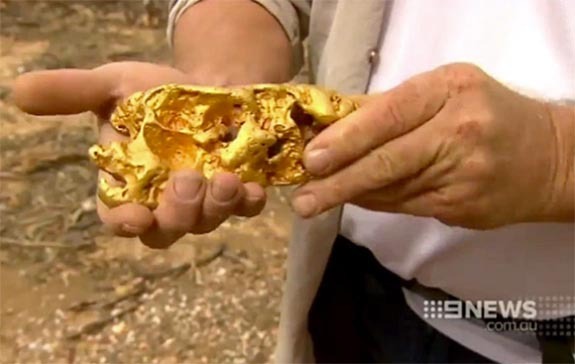 Payne told authors Jon Kutner and Spencer Leigh that she had no idea that "Band of Gold" would be such a big hit. Born in Detroit in 1942, Freda Charcilia Payne grew up listening to jazz singers, such as Ella Fitzgerald and Billie Holiday. As a teenager, she attended the Detroit Institute of Musical Arts and her first professional jobs were singing radio commercial jingles. In 1963, she moved to New York City and worked with many different entertainers, including Quincy Jones and Pearl Bailey. She release her first album in 1964, but didn't hit it big until she returned to Detroit in 1969 and signed with the record label Invictus. By 1970, Payne was a household name, thanks to the success of "Band of Gold." Written by Ronald Dunbar and Edythe Wayne. Performed by Freda Payne. Credit: By CBS Television [Public domain], via Wikimedia Commons. 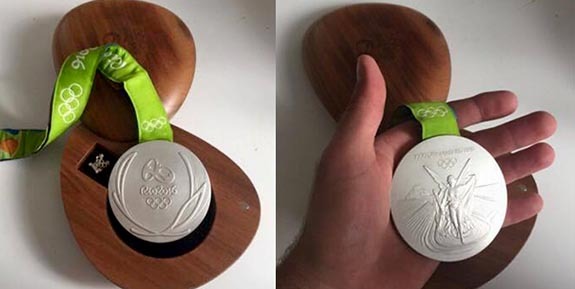 Polish Olympian Piotr Malachowski, who won a silver medal in the discus throw at the 2016 Rio Games, put his cherished medal up for auction last week to help pay for the treatment of a three-year-old boy with a rare form of eye cancer. The boy, Olek Szymanski, has a condition called retinoblastoma, a malignant cancer that mostly affects children. Treatment of the cancer is very complex and demands the expertise of surgeons in New York City. 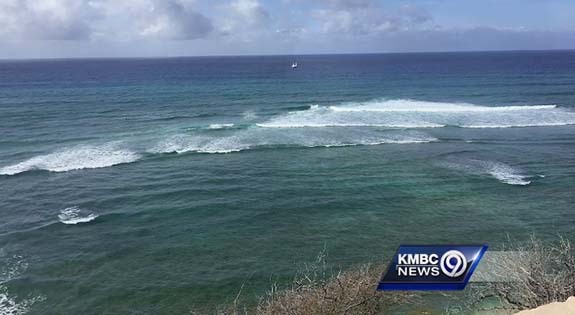 Malachowski hoped to raise $84,000, which is two-thirds of the $126,000 cost of the surgery. 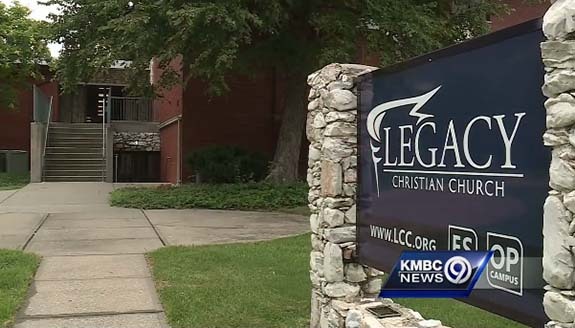 A Polish foundation called Siepomaga had pledged to pay one-third of the fee. On Tuesday of last week, with the bidding at $19,000, Malachowski announced that he was closing the eBay auction. 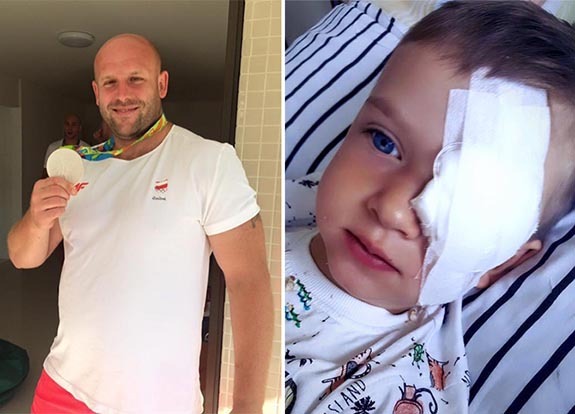 Malachowski's selfless efforts to assist the little boy had caught the attention of Polish billionaire siblings Dominika and Sebastian Kulczyk, who agreed to buy the silver medal and cover the costs of young Olek's treatment. "We were able to show that together we can do wonders," the 33-year-old Malachowski wrote. "My silver medal today is worth a lot more than a week ago. It is worth the life and health of a small Olek. It is our great shared success." According to The Washington Post, Malachowski learned of the child’s illness from the boy’s mother, who wrote to him asking for his help. The giant man with a heart of gold is a two-time Olympic medalist. In 2008, he won a silver medal in the discus event at the Beijing Games. Credits: Images via Facebook/Piotr Małachowski. 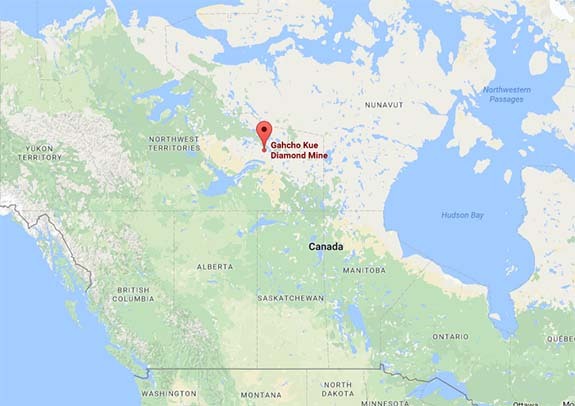 Diamantaires from the four corners of the earth have converged on the picturesque Pacific port city of Vladivostok, Russia, to get a chance to bid on ALROSA's "special size" rough diamonds, the largest of which tips the scales at 401.97 carats. Bidders are vying for 19 diamond lots boasting a total weight of 1,098 carats. 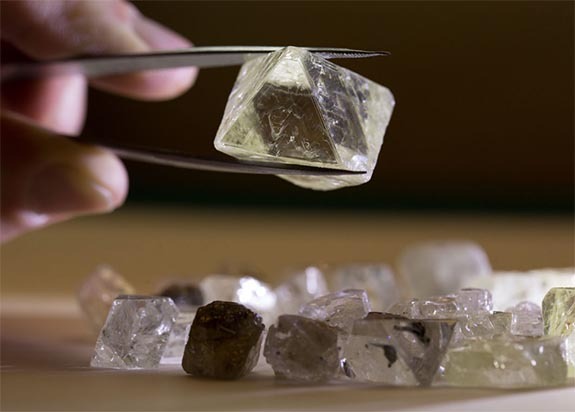 What all the rough diamonds have in common is a weight of 10 carats or more and an origin at one of ALROSA's diamond mines. 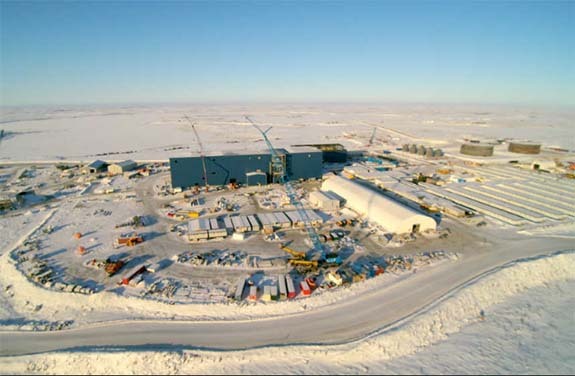 The Russian diamond company currently operates 11 kimberlite pipes and 16 alluvial deposits, producing 38.3 million carats of rough diamonds annually. 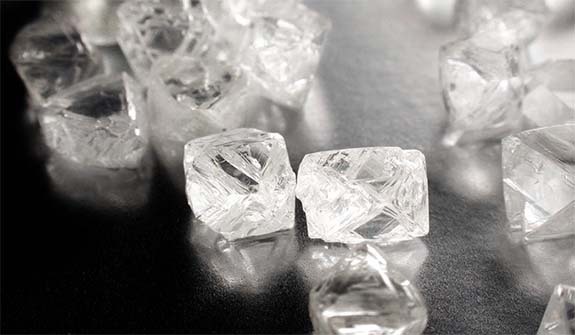 Running concurrently with the International Auction of Special Size Rough Diamonds will be ALROSA's Polished Diamond Tender. The most coveted of the 28 diamonds up for sale is a 40.25-carat round. 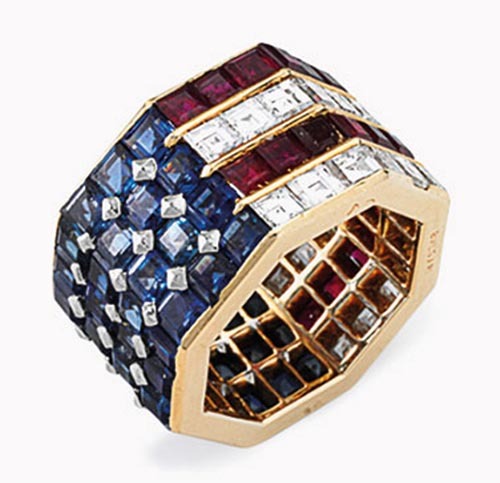 Eighteen of the 28 gems are fancy colored and five polished diamonds weigh more than 5 carats. 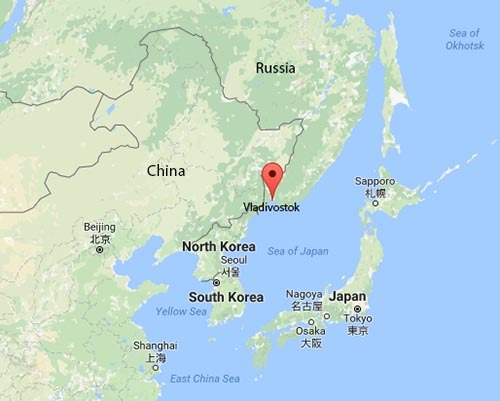 A total of 30 companies from the U.S., Hong Kong, Israel, India, Belgium and Russia were handpicked to attend ALROSA's diamond events in Vladivostok. 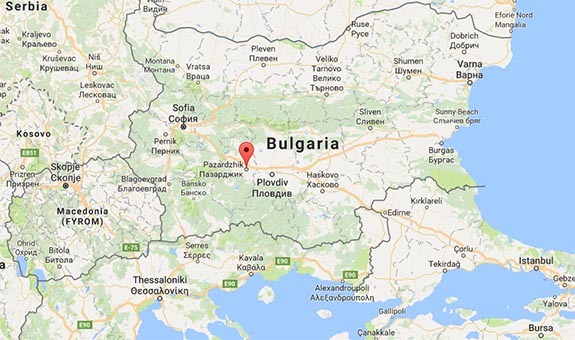 It is the first time ALROSA has held its auctions in this city, which overlooks Golden Horn Bay, near the borders of China and North Korea. Diamonds will be on display through September 2, with the Rough and Polished auctions taking place on September 3. Credits: Diamond images courtesy of ALROSA. 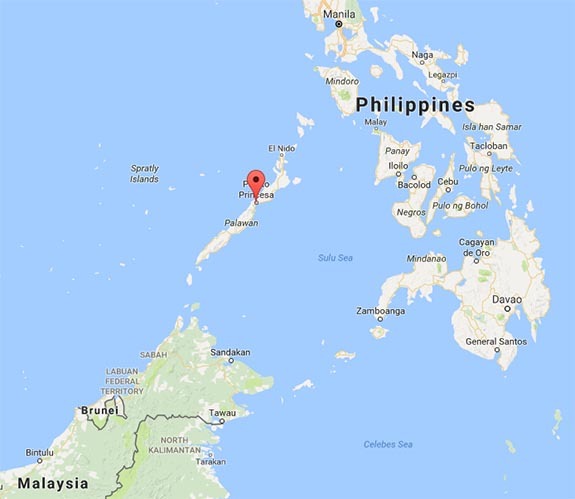 Map via GoogleMaps.com.